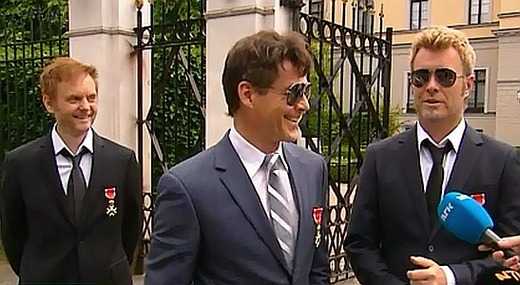 a-ha arrived at the Royal Palace in Oslo earlier today, where they had been granted an audience with King Harald. This is taking place in connection with the band members being appointed Knights First Class of the Royal Norwegian Order of St. Olav last year. “It’s an honor to get recognized on an official level for the work we’ve done together. We accept it with gratitude and humility”, Magne told the press. One reporter asked what they expected to talk about with King Harald. “I reckon he’s a professional in that area, so he’ll lead the conversation”, Magne said with a laugh. “We’re not coming here with lots to tell. Instead, we’ll listen to what the King has to say”, Morten added. 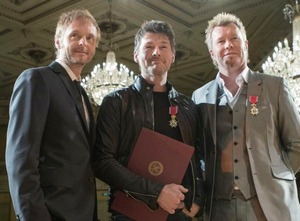 Another reporter asked how it is to come together as a-ha now, to receive this honour. “It’s becoming increasingly harder to gather the three of us together, so we’re grateful to His Majesty for this opportunity”, Magne said. Watch video clips of a-ha arriving on nrk.no and aftenposten.no. There is also a large photo on vg.no and a photo set by Stian Andersen on a-ha.com’s Facebook page. Receiving the Royal Order of St. Olav, Nov. 6th 2012. Morten, Magne and Paul have been invited to the Royal Palace in Oslo on Monday, June 10th, for an audience with King Harald of Norway at 12:30 (local time). This is in connection with the band members being appointed Knights First Class of the Royal Norwegian Order of St. Olav in November last year. Anyone who receives the Order of St. Olav are eventually granted an audience with the king. But this isn’t the first time the members of a-ha have been granted an audience with the King of Norway. In February 1987 they were invited to the Royal Palace by the late King Olav, in recognition of their international achievements. Here is a picture of them afterwards, standing outside the Royal Palace with a group of fans. “It was a great experience”, Morten told the press back then. 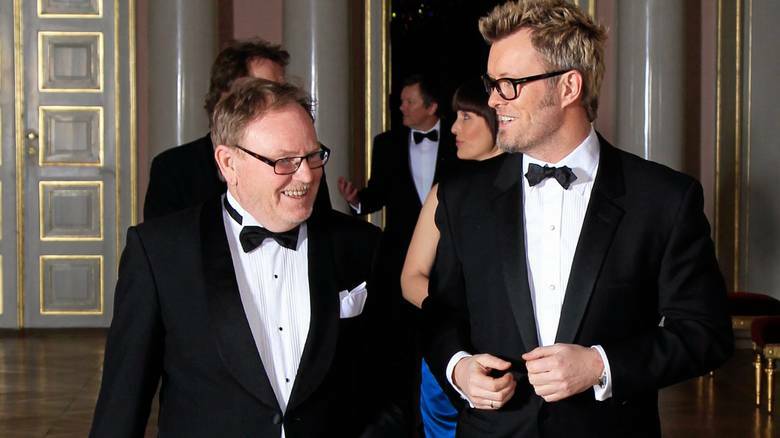 Magne was one of the guests at the Royal Palace in Oslo yesterday, as King Harald and Queen Sonja held an official dinner in honour of Prince Charles and his wife Camilla, who are on a 3-day visit to Norway. Aftenposten has a picture of Magne arriving here. Princess Märtha Louise celebrated her 40th birthday at the Royal Palace in Oslo tonight. Magne and Heidi were among the celebrity guests attending the party, along with people such as director Harald Zwart and singer Lene Marlin. Pictures of some of the guests arriving can be seen at VG.no and Dagbladet.no.